Representatives of the promoters, partners, and stakeholders of the Himalayan Climate Change Adaptation Programme (HICAP) met in Delhi from 17-19 June 2015 to discuss and set direction for the next two-and-a-half years of the Programme’s implementation. Three years into its six-year implementation period, HICAP has generated a large volume of science and knowledge on adaptation to change in the region. This includes 77 publications in various stages of drafting, review and circulation, spanning seven components with a number of scientific and research disciplines, and situated in five sub-basins in four Hindu Kush Himalayan countries. Additionally, the several pilots and action research launched under the Programme have given valuable experience to illustrate and elucidate the research findings in relation to the way change is felt and handled on the ground. The three-day workshop focused on mapping the way forward for HICAP and finding ways in which the diverse knowledge produced under the programme can be synthesized into knowledge products. These knowledge products could then be used to effectively communicate information about climate change and adaptation to different stakeholders and inform action on the ground. In the opening session of the workshop, stakeholders shared their perspectives and expectations on synthesis of HICAP knowledge. Among them, Nisha Mendiratta of the Department of Science and Technology, Government of India, highlighted several linkages between the Indian government’s needs and HICAP’s work and suggested a number of concrete areas where knowledge generated under HICAP can feed into the government activities. The workshop included discussions on strategies and opportunities for policy engagement, synthesis of HICAP results into a coherent whole, and the continuation and impact of the ongoing HICAP action research and pilots. 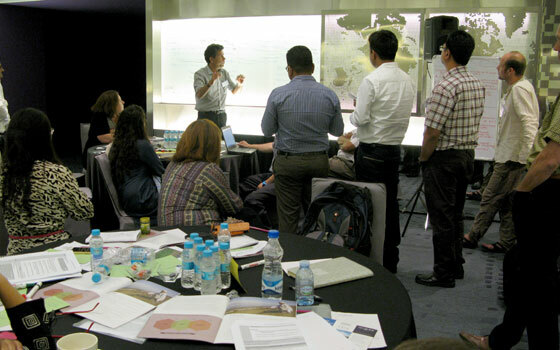 On the final day of the workshop, HICAP team members created an overall plan of activities for the final two-and-a-half years of its programmatic period. Participants in the workshop included the three promoters (ICIMOD, the Centre for International Climate and Environmental Research - Oslo, and GRID-Arendal), three partner organisations (Nepal’s Center for Environmental and Agricultural Policy Research, Extension and Development, and China’s Kunming Institute of Botany and Chengdu Institute of Botany), as well as other stakeholders like DFID-India.